﻿Published by Sareth Ney on April 11, 2019 at 1:54 p.m.
Danny Wimmer Presents (DWP) is proud to announce their partnership with Metallica’s Blackened Whiskey and Enter Night Pilsner. Metallica’s Blackened Whiskey is a super-premium American whiskey blend crafted by the late master distiller, Dave Pickerell. Metallica’s Enter Night Pilsner, is collaboration between the band and Stone Brewing Company. Boilermaker pop-up will be the on-site home, for both beverages and craft cocktails. 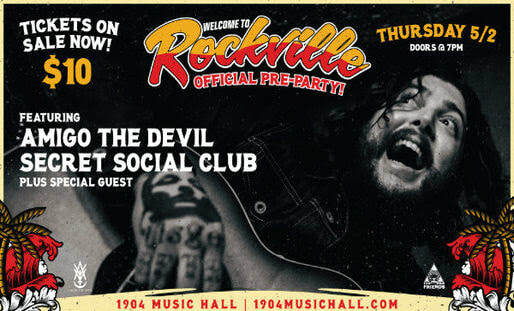 On May 2—Amigo The Devil, Secret Social Club and a special guest will perform at the Welcome To Rockville Presents The Official Pre-Party at 1904 Music Hall. Doors will open at 7 p.m. 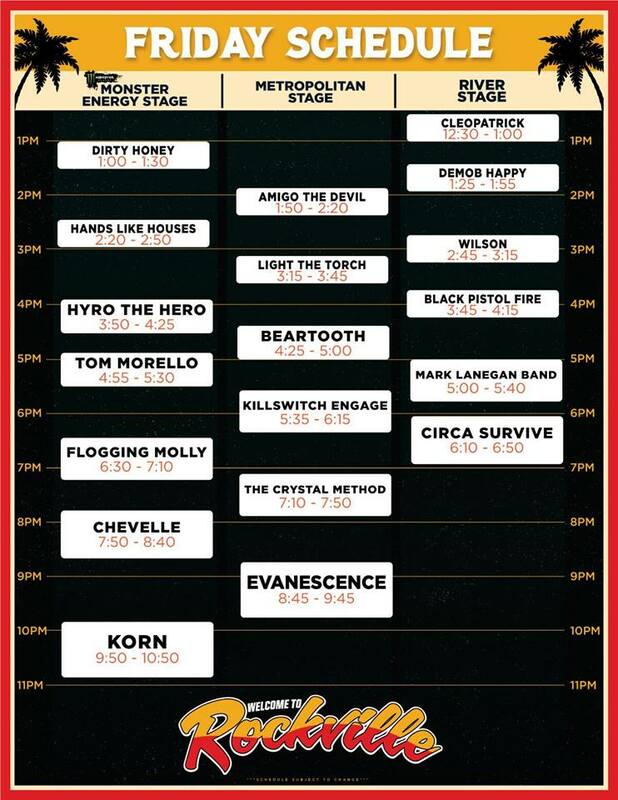 The first 100 Welcome To Rockville single day ticket or weekend wristband holders will be able to attend for free. For those needing to purchase a general admission ticket, they are $10 each and available at www.1904 musichall.com. 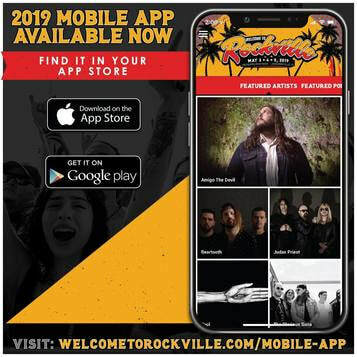 For a complete listing of DWP’s onsite food beverage and beverage options by Southern Hospitality Concessions LLC, visit www.welcometorockvillefestival.com/experiences. 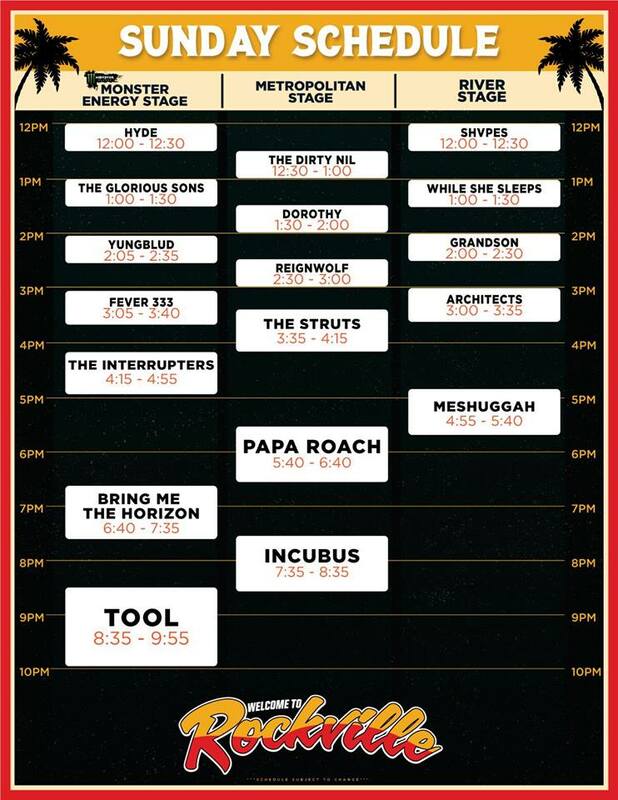 Along with Boilermaker pop-up, fans ages 21 and over can visit the following: Bud Light, Caduceus Cellars & Merkin Vineyards Wine Garden (owned by Maynard James Keenan of Tool, A Perfect Circle and Puscifer), Kraken Black Spiced Rum Heavy Tiki Bar and Cigar City Brewing. Sponsors consist of: Monster Energy, Bud Light, Zippo, f.y.e. Fan Experience, Fxck Cancer / Dyin 2 Live Dreams Program, Take Me Home, Three Olives, Jose Cuervo, Kraken Black Spiced Rum, The Music Experience, Jack Daniel’s, Demons Behind Me, Cigar City Brewing, Fearless Records, Roadrunner Records and Sweetwater Studios. Very Important Person Weekend (VIP), VIP Sunday tickets and hotel packages are sold out. 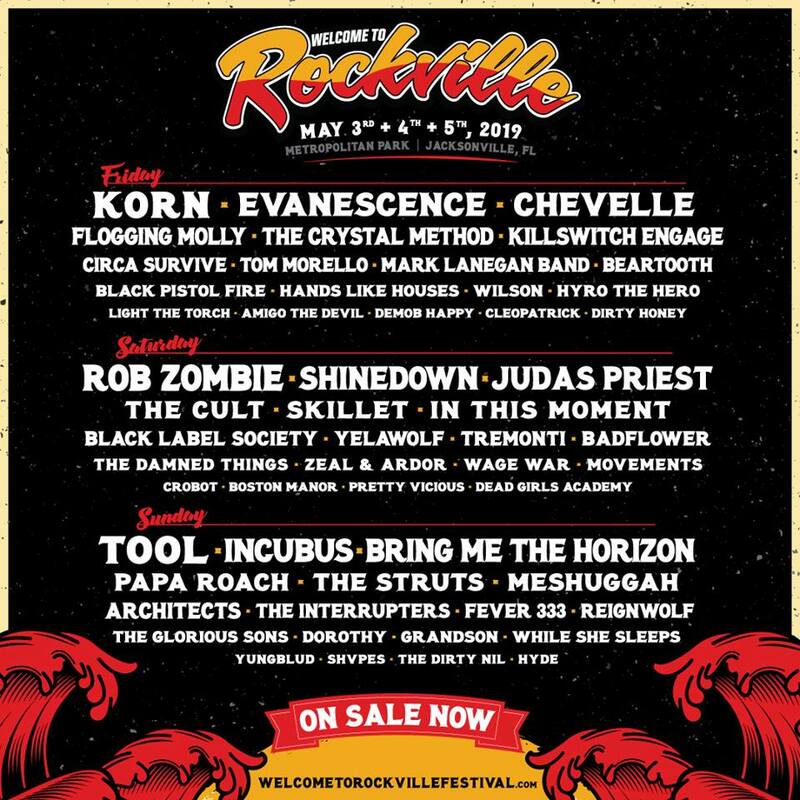 A limited number of general admission, VIP, and camping passes are still available at www.welcometorockvillefestival.com. The app is available to download via Google Play and Apple stores. DWP produces Aftershock Festival, Bourbon & Beyond, Chicago Open Air, Epicenter Festival and many more. ​Metropolitan Park is located at 1410 Gator Bowl Blvd. in Jacksonville, Fla.
About Danny Wimmer Presents: Since 1993, music industry veteran Danny Wimmer has been producing concerts and festivals, both large and small. In 2011, he formed Danny Wimmer Presents, which now produces several of the largest rock and alternative festivals in the U.S. By combining A-list talent with local cuisine and culture, DWP has become recognized within the industry for delivering the highest-quality entertainment experiences to fans, artists, sponsors, partners and host cities. DWP creates memorable and all-encompassing festival experiences, leaving both consumers and partners with lasting and meaningful impressions. DWP will continue to add new music festivals to its already stellar portfolio, which currently includes Aftershock Festival, Bourbon & Beyond, Chicago Open Air, Epicenter Festival, Hometown Rising, Louder Than Life, Sonic Temple Art + Music Festival, and Welcome To Rockville. 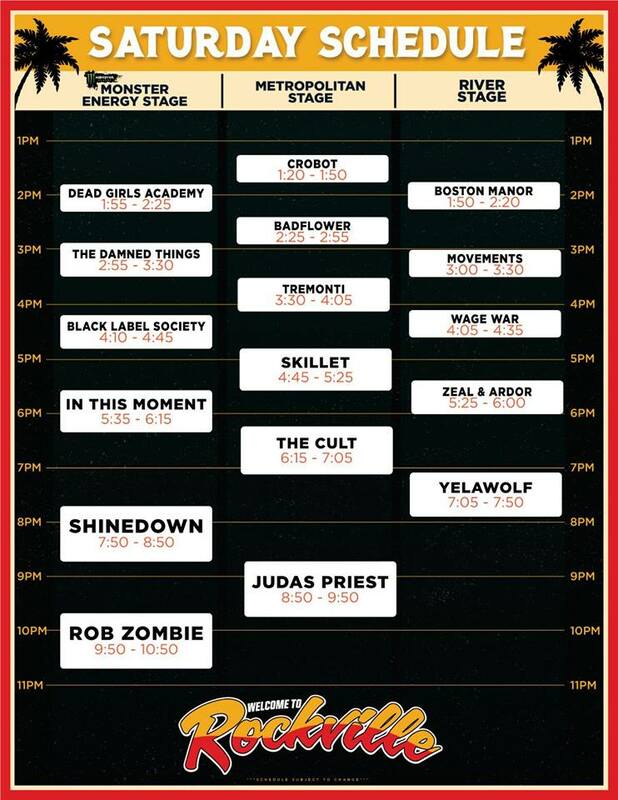 Previous DWP festivals include Rock On The Range, Carolina Rebellion, Northern Invasion and more.